Learning vocabulary is hard. Too often, it’s taught without real context and application, with a list of words and skill-and-drill learning. Unfortunately, this isn’t really learning for many students, at least not in the long term. When vocabulary is killed with skill-and-drill, it often is forgotten after (if not before) the dreaded test. At best, the forgotten words are meaningless, and at worst, they become a waste of valuable time. And it pains me to admit my guilt. As an English teacher, I value language, vocabulary, and grammar, but have just never been able to find a good enough way to teach these essential skill and topics. Like my students, I’m a work in progress, and I’m getting better. Last year, I taught an SAT/ACT Review course as a regular teaching period, so vocabulary was a major focus. A strong vocabulary is essential in succeeding on many sections of the test, from defining words in context to reading comprehension. My co-teacher, who designed the course, had a great system for all of the SAT skills and content. We then worked together to integrate technology to make our jobs easier, feedback more effective, and to bring in some valuable 21st century skills. Take a look at the SAT Vocabulary List. Our students needed to learn these 600 or so words on one semester. That’s crazy! But as Gandalf said, “All we have to decide is what to do with the time that is given us.” And for the SATs, time spent on vocabulary matters. In addition to studying the word lists, students choose words from each list to create a visual representation of. They had to define the word, use it in a sentence, and create a picture of video that illustrated the meaning. We encouraged students to post their work on social media with #OHS2400, our school initials and the highest score on the SATS. Students also posted their work on our Google+ Community and submitted a link to their media on a Google Form. This helped us create a database of visual vocabulary. 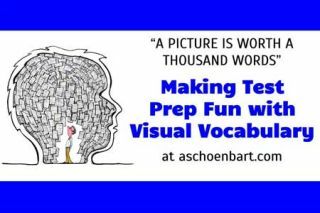 At the end of the year, we have 470 examples of visual vocabulary documented. Not all of them were great, but so many were. They required creation and critical thinking, and it made vocabulary fun. Then students practiced their knowledge by creating questions for Kahoot quizzes to apply and reinforce the vocabulary and grammar rules. For any content, we also practiced skills, and students used Quizlet, Kahoot, and online portfolios to assess their growth and reflect. Let’s face it: grammar and vocabulary are boring on their own. In isolation, few people enjoy the study. But with application, purpose, and creativity, I hope we added some more meaning to this work and test preparation. It’s not a perfect system, but it worked well to improve our students’ engagement with vocabulary. Throughout the Visual Vocabulary assignments, students had to make choices in selecting their words, define them, use them, think critically about their meaning, and then create media. As they saw each other’s work, the class improved as a whole because it was fun and added some friendly competition with visual and media literacy. Remember, a picture is worth a thousand words. How do you teach vocabulary in your classroom? What strategies or lessons have you found effective for making vocabulary and test preparation more meaningful? Share in the comments or reach out on Twitter.